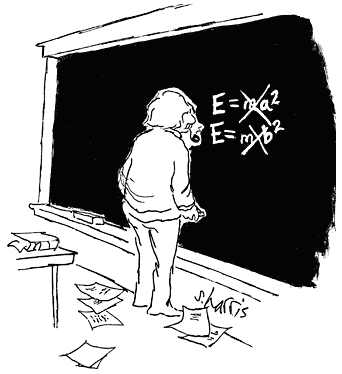 One memorable Sidney Harris cartoon shows Albert Einstein at a chalkboard. He's written E = ma2, crossed it out, then E = mb2, and crossed that out. You can see a copy of the cartoon, here. It's the cover image of one of his books. Harris has also published a book entitled, "Einstein Simplified," containing cartoons on many science subjects, not just Einstein. Albert Einstein in 1882, three years of age. This is the oldest known photograph of Einstein. Einstein's discovery of mass-energy equivalence probably didn't happen that way. Not only that, but his publication of this principle didn't contain the E = mc2 equation; instead, Einstein wrote L = mc2, where L is the Lagrangian. "The mass of a body is a measure of its energy-content; if the energy changes by L, the mass changes in the same sense by L/9 x 1020 , the energy being measured in ergs, and the mass in grams." There was one experiment at the Stanford Linear Accelerator Center (SLAC, Stanford, CA) in 1997 that gave indirect evidence for Breit–Wheeler pair production. In that experiment, a high energy laser was directed at an accelerated beam of electrons which reflected some of the photons back into the incident laser beam. This allowed an interaction between high energy photons, and the data indicated that electron-positron pairs were produced. "Within a few hours of looking for applications of hohlraums outside their traditional role in fusion energy research, we were astonished to find they provided the perfect conditions for creating a photon collider." The research team hopes to do the actual experiment within the year. [6-7,9] The experiment would need to be done at one of the few sites with such capability. These include the OMEGA Laser at the University of Rochester (Rochester, New York) ,[6-7,9] and a laser at an atomic weapons facility in Aldermaston, Berkshire, UK. This experiment will simulate a process presumed important in the first hundred seconds of the universe, and also in present day gamma ray bursts. The research was funded by the Engineering and Physical Sciences Research Council, the John Adams Institute for Accelerator Science, the Atomic Weapons Establishment, and the Max-Planck-Institut für Kernphysik. Sidney Harris, "What's So Funny About Science? : Cartoons from American Scientist," William Kaufmann, June 1977, ISBN-13: 978-0913232392, 120 pp. (via Amazon). Sidney Harris, "Einstein Simplified, Revised Edition: Cartoons on Science," Rutgers University Press, February 25, 2004, ISBN-13: 978-0813533865, 160 pp. (via Amazon). A. Einstein, "Ist die Trägheit eines Körpers von seinem Energieinhalt abhängig? ", Annalen der Physik, vol. 18, no. 13 (1905). A PDF file of an English translation (Does The Inertia Of A Body Depend Upon Its Energy-Content?) can be found here. O. J. Pike, F. Mackenroth, E. G. Hill and S. J. Rose, "A photon–photon collider in a vacuum hohlraum," Nature Photonics, Advance Online Publication, May 18, 2014, DOI:10.1038/nphoton.2014.95. Megan Garber, "How to Take Light and Make Matter," The Atlantic, May 19 2014. Rebecca Jacobson, "Scientists hope to make matter from light, proving Einstein's theory," PBS, May 19, 2014. Pete Spotts, "How to make matter from light? Physicists propose ingenious tool," Christian Science Monitor, May 20, 2014. Ian Sample, "Matter will be created from light within a year, claim scientists," The Guardian (UK), May 18, 2014. Linked Keywords: Scott Adams; Dilbert; comic strip; technology; humor; profession; mathematics; computer science; xkcd comic; Randall Munroe; stick figure; philosopher; Sidney Harris; science; cartoon; magazine; American Scientist; book; Albert Einstein; blackboard; chalkboard; photograph; Wikimedia Commons; mass-energy equivalence; scientific literature; publication; Lagrangian; classical mechanics; kinetic energy; potential energy; English language; translation; mass; energy; erg; gram; explosion; thermonuclear weapon; atomic nucleus; nuclear; radioactive decay; particle accelerator; elementary particle; electromagnetic radiation; light; quantum electrodynamics; theory; modern physics; Star Trek transporter; physicist; Blackett Laboratory; Imperial College (London, UK); Max-Planck-Institut für Kernphysik (Heidelberg, Germany); experiment; Breit–Wheeler pair production; American; John Archibald Wheeler; Gregory Breit; photon; electron; positron; laboratory; laser; Stanford Linear Accelerator Center; Stanford, CA; reflection; data; Feynman diagram; Oliver Pike; Nobel Prize; Great Britain; British; German; gamma ray; hohlraum; German language; inertial confinement fusion; laser fusion; speed of light; gold; thermal radiation; OMEGA Laser; University of Rochester (Rochester, New York); Aldermaston, Berkshire, UK; universe; gamma ray burst; Engineering and Physical Sciences Research Council; John Adams Institute for Accelerator Science; Atomic Weapons Establishment.